MINNEAPOLIS, MN—As its name implies, Global Conferencing Solutions (GCS) is a company with an eye for worldwide enterprise. Making a move earlier this summer into downtown Minneapolis, the video communications service company opened a new videoconferencing center. 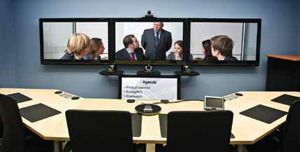 The GCS executive videoconference suite is capable of delivering full HD, dual-stream video. Anchored by a telepresence suite and an executive videoconference suite, the 4,000-square-foot facility also houses several smaller rooms, including breakout seating areas, a kitchen, and a dedicated meeting space. Taking square aim at a client base including Fortune 500 companies, small and midsize businesses, government agencies, colleges and universities, law firms, and health care providers, just to name a few, the center promises to serve as a lively conduit of sales force communication and training. Using a Scopia XT1000 highdefinition videoconferencing system from Radvision, the executive suite is capable of delivering full HD (1080p 30 fps), dual-stream video. A pair of PTZ cameras with 10X optical zoom and wide angle capabilities provide the suite with visual coverage, while conference participants gather around a custom, 16-foot articulating table built by Nevers Industries. Altinex’s CP500-100 Neutron Controller serves as the hub of all room orchestrations, supported by full-scale touchpanel technology and switching also supplied by Altinex. On the audio side of the spectrum, Crown amplification feeds model CM660 ceiling-mounted loudspeakers from Current Audio to fulfill sound reinforcement needs; audio signals are gathered via seven ES947 boundary microphones from Audio-Technica and a single ES915H15 hypercardioid condenser gooseneck also from A-T.
A Firehawk 100-inch diagonal screen from Stewart provides the suite with ample room for display. Custom-configured to enhance the space, Brightline T-Series lighting rounds out the list of major elements found within the bill of materials used to complete the room, along with an Arcam DV79 DVD player and 1080p digital projector from M-Vision. The latter was deployed using an above tile, CMS440 suspended ceiling kit from Chief’s Speed-Connect Series, and a CMS018W extension column/ RPMA260 projector mount also chosen from the Chief catalog. Three of the screens in the GCS videoconference facility’s telepresence suite are 60-inch, model 60PG30FC widescreen plasma units from LG. This triumvirate of big flat panels is joined by a fourth “confidence monitor” (a 50-inch LG model PM4M plasma) mounted directly beneath the larger 60-inch center screen that’s used to display supplemental imagery like presentations, graphs, and spreadsheets. Chief’s CMS440 suspended ceiling kit helped keep installations clean and orderly within the new GCS videoconference center. To obtain the sleek look GCS was seeking, save time and money on the installation, and position the screens in precisely the right locations and angles, three FUSION Series model XTMU tilt mounts from Chief were chosen for the larger screens, while a FUSION LTMU mount was selected for the 50-inch confidence monitor. One challenging aspect of hanging the three main screens was arranging them in a perfect line without any gaps between the units and at an absolutely uniform and level height. The FUSION mounting system met these demands handily, tying the screens together as a single entity. Providing up to 23.5 inches of lateral shift, the FUSION XTMU mounts additionally allowed the entire assembly to be positioned exactly where it needed to be without concern for where the studs were in the walls.